YOU ARE HERE: Home Facilities DiagCor Biotechnology Lab. In 2004, Po Leung Kuk Laws Foundation College (PLKLFC) was established. In the first academic year 2004/2005 of PLKLFC, a school-based biotechnology curriculum was launched for our S.1 students. To support the practical lessons in biotechnology, our Biotechnology Laboratory equipped with cell culture facilities was established in January, 2005. The biotechnology curriculum for Secondary 2 and 3 students was built up in the academic year of 2005/2006 and 2006/2007, respectively. To share our experience in the development of school-based biotechnology curriculum, our team of biotechnology teachers and school Principal were invited to present the topics titled “The Development of a School-Based Science Curriculum (Biotechnology): Let us work together to make a difference” in “iLongman - Integrated Science Seminar” on March 24, 2007 and “Do we need to do something to our primary and junior secondary science curriculum?” in “Learning for the Future” Series on January 10, 2009, respectively. 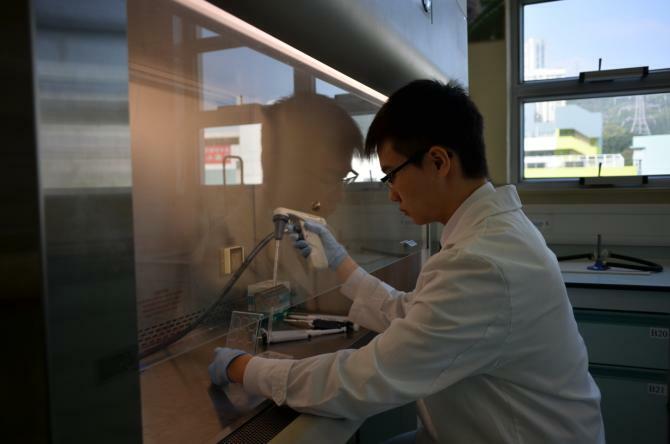 In order that our Biotechnology Laboratory can support more diverse types of advanced experiments in biotechnology like real-time PCR, DNA fingerprinting, large-scale plant tissue culture and microbial culture, the 2nd phase laboratory development was initiated in 2012. 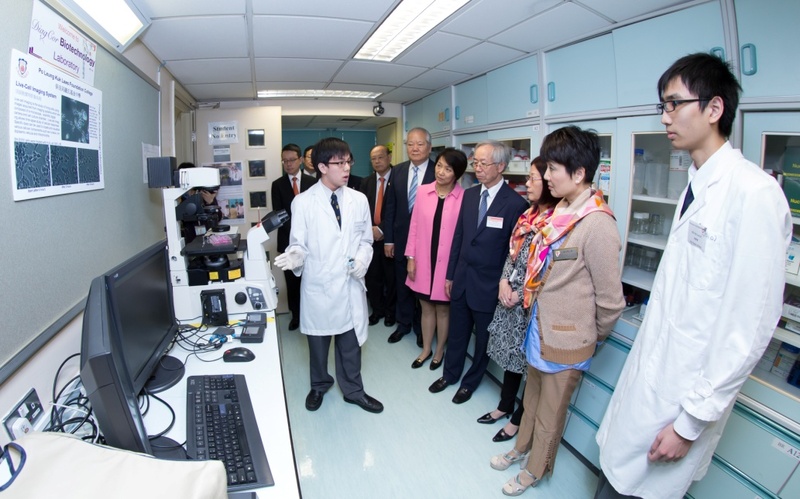 About HK$950,000 was utilized to purchase advanced-level equipment which can support research-based learning in biotechnology lessons and other programs such as Neuroscience Club for scientifically gifted students. In 2013, our biotechnology teachers presented a paper titled “Effectiveness of the school-based Biotechnology curriculum – a science gifted programme for all” in the International Conference of East-Asian Association for Science Education 2013 to mark the important milestone of the development of our school-based biotechnology curriculum. In 2006, 2008, 2010, 2013 and 2015, our students presented their research findings in international conferences in USA. 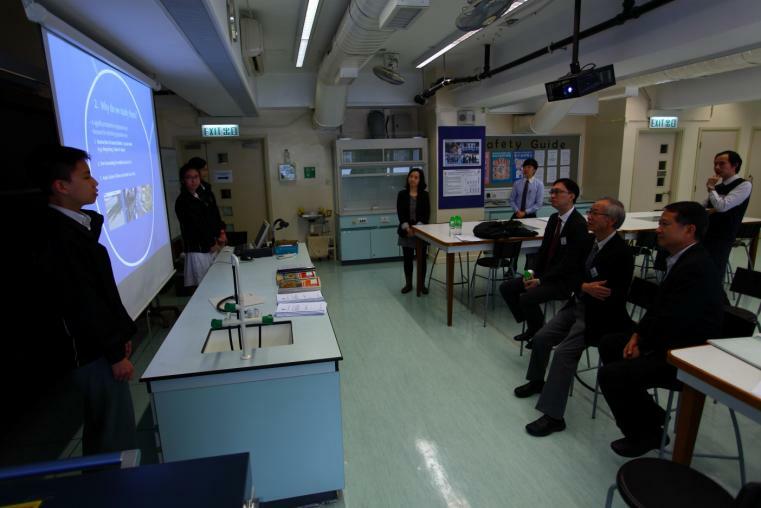 On November 4, 2014, our school received a generous donation from DiagCor Bioscience Incorporation Limited for supporting the future development of our biotechnology curriculum. 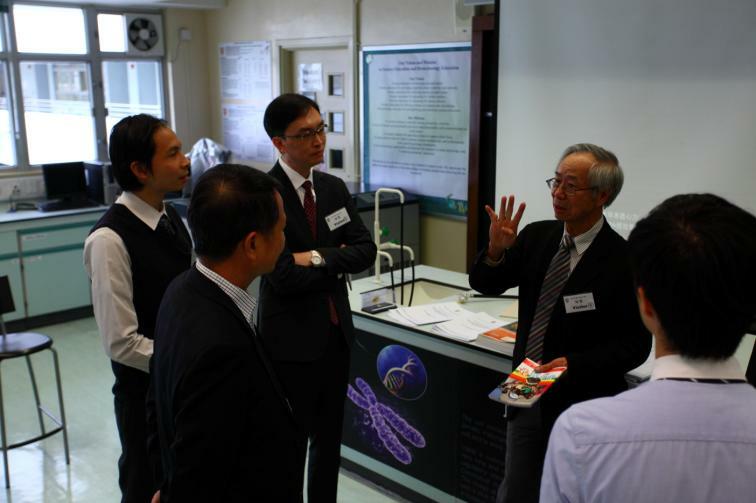 On November 4, 2014, Prof. Joseph Wing-On TAM, CEO & Chairman of the Board, DiagCor Bioscience Inc. Ltd. and Mr. Matt AU, COO and CFO of DiagCor Bioscience Inc. Ltd. visited our biotechnology laboratory. They appreciated the research-based learning approach in our gifted education programme in science and gave us advice on further development of biotechnology education. Our students were presenting a research project about DNA analysis of horseshoe crabs. Prof. TAM was introducing research methods in DNA applications. 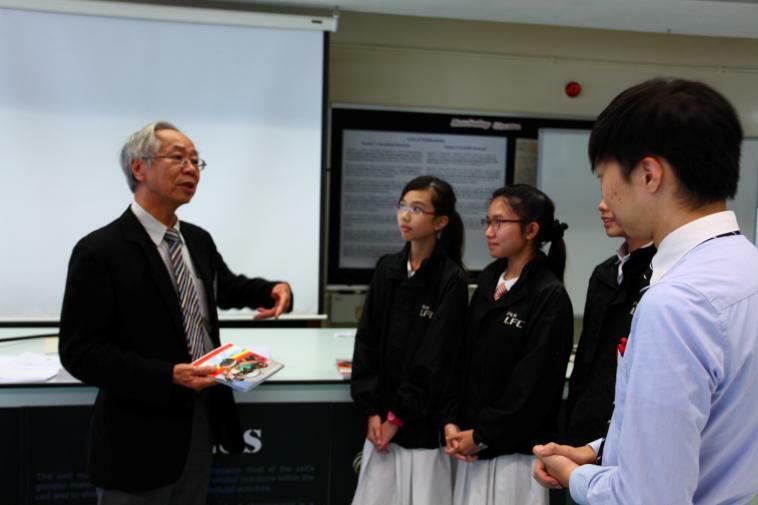 Prof. TAM was sharing his vision in science education. Mr. Wing-Kwong CHAN, Principal of PLKLFC, on behalf of PLKLFC, was pleased to receive the generous support from DiagCor Bioscience Inc. Ltd. for the future development of our school-based biotechnology curriculum. To recognize the generosity of DiagCor Bioscience Incorporation Limited, our biotechnology laboratory is named as DiagCor Biotechnology Laboratory. 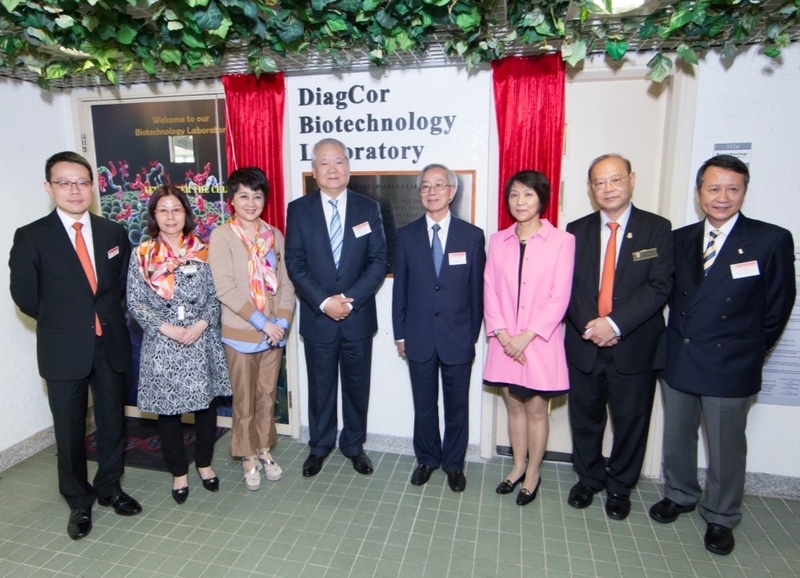 The Grand Opening of DiagCor Biotechnology Laboratory was officiated by Professor Yuk-Lam LO, Honorary Chairman of Hong Kong Biotechnology Organization and acknowledged by PLK Board of Directors 2014-2015 chaired by Ms. On-Kei LEONG on March 16, 2015. The Dedication Ceremony of DiagCor Biotechnology Laboratory was held on March 16, 2015. 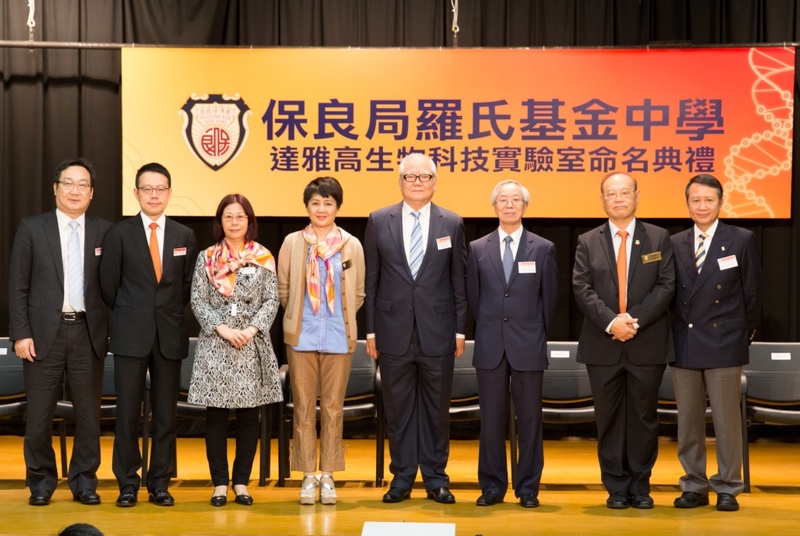 The ceremony was officiated by Professor Yuk-Lam LO (fifth left), Honorary Chairman of Hong Kong Biotechnology Organization and acknowledged and chaired by Ms. On-Kei LEONG (fourth left), Chairman of PLK. 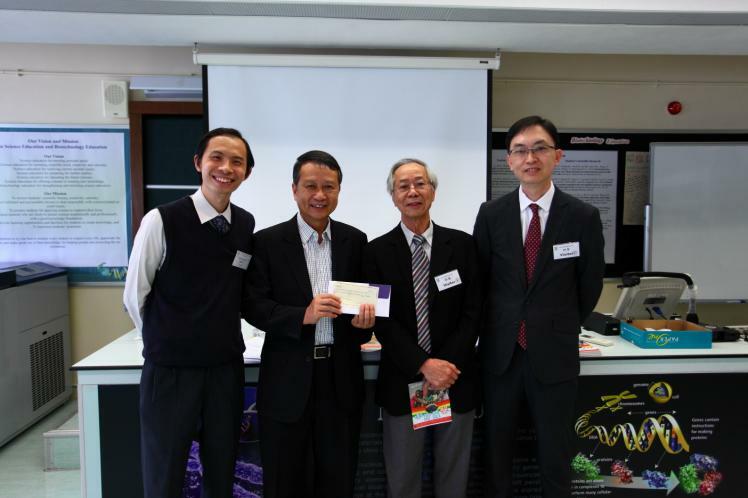 We thank for the generous donation from Professor Wing-On TAM (third right), C.E.O. & Chairman of the Board, DiagCor Bioscience Inc. Ltd. The biotechnology laboratory is named as DiagCor Biotechnology Laboratory to recognize the generosity of DiagCor Bioscience Incorporation Limited. HAU Pak-Chuen (first left) and SHI Pok-Lai (first right), Senior Members of Neuroscience Club were demonstrating how to use the live-cell imaging system to study the death of neuronal cells. Students from our affiliated primary school, Po Leung Kuk Luk Hing Too Primary School showed great interest in plant tissue culture. CHOW Pak-Chun (first left), Vice Chairman of Neuroscience Club was explaining the procedures to do bacterial culture for the study of microbial populations in our green roof. A team of junior form students was demonstrating their ecological study on horseshoe crabs with the use of DNA technologies. 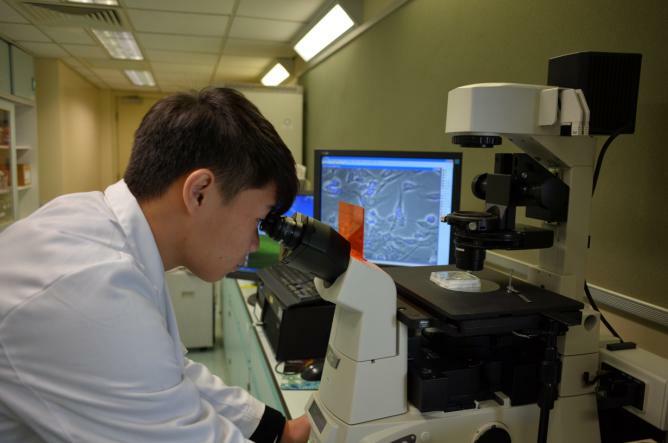 MA Ho-Him, Chairman of Neuroscience Club was observing cultured cells (SH-SY5Y cells) using Live-Cell Imaging System. 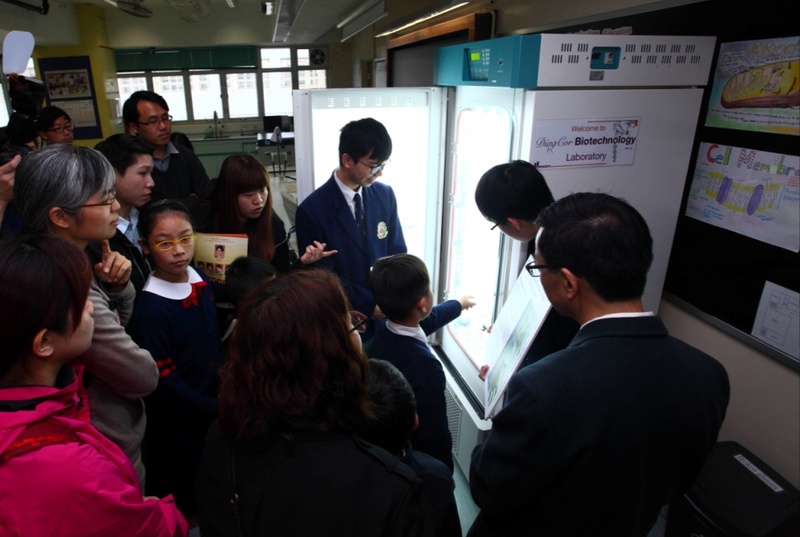 CHOW Pak-Chun, Vice Chairman of Neuroscience Club was doing a cell culture experiment in a Class II Safety Cabinet. 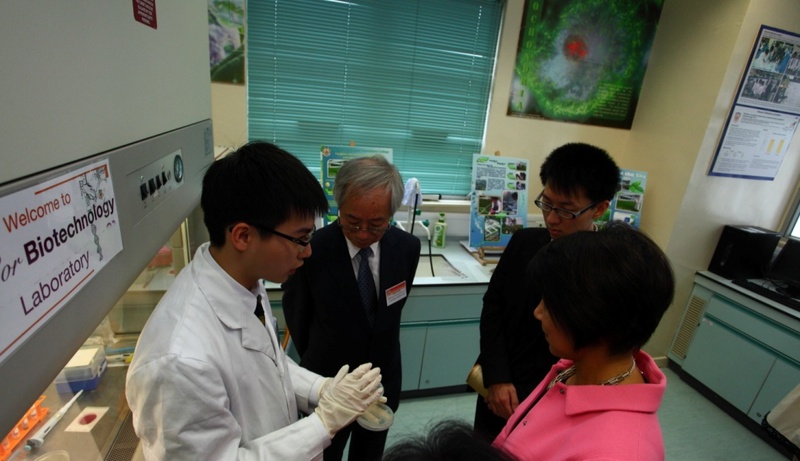 MA Ho-Him (right) and CHOW Pak-Chun (left) were introducing how they did their research on drug discovery. 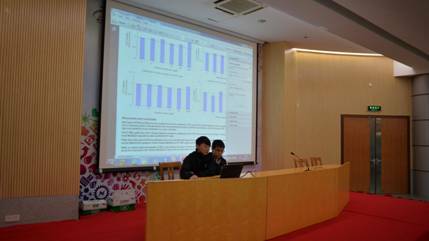 (https://youtu.be/Vk1dtmpjv1g) MA Ho-Him (right) and CHOW Pak-Chun (left) were sharing their research findings in a secondary school in Foshan, China.